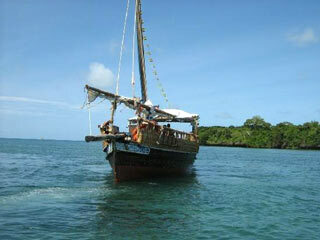 Pilli Pipa has being running dhow safaris since 1989. It is a small family owned company run by Selina and Harm Lutjeboer. Limited numbers and a safe, personal and professional service to its guests. The owners of Pilli-Pipa, Harm and Selina, are both qualified PADI MSDT Dive Instructors and First Aid Instructors with numerous specialities. Selina has a BSc. Hons in Marine and Freshwater Biology and a Masters degree in Aquaculture from Stirling University. They have both worked as diving instructors in many countries including Jamaica, Thailand, Malta, England, Holland and Kenya before settling on Wasini Island. Harm speaks fluent Dutch, German and English while Selina speaks in French, German, Italian, Spanish, English and Kiswahili. Harm takes care of the maintenance of engines and equipment, but still enjoys diving and on the odd occasion will lead dives. 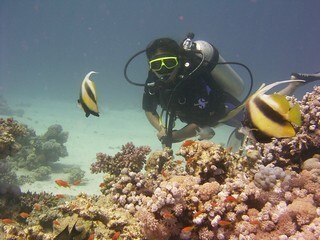 Selina dives more often and has a keen eye for spotting those difficult to see weird and wonderful creatures. Snorkel with qualified marine guides who will teach and guide you along the reef whether you are a complete beginner or experienced snorkeler. Limited numbers and personal service: For certified divers normally less than 3 divers per guide and maximum 6 divers per dive. Fun dives offered for those without certification or diving for the first time. PADI and NAUI world recognised instruction. We teach PADI (Professional Association of Dive Instructors) courses from Open Water to Assistant Instructor. We are a NAUI (National Association of Underwater Instructors) IDC (Instructor Development Course) centre and teach courses including NAUI Instructor and Instructor Trainer. Kisite Marine Park is home to Dolphins and sightings occur on average 6 days out of 7. Sumptuous sea food, fresh crab and fillet fish, or delicious grilled chicken or vegetarian all prepared Swahili style with a touch of finesse. All at Selina and Harm's private home. The price includes transport to and from hotels, all equipment including fins, Kenya Wildlife Services Marine park fees, use of up to date snorkelling equipment, trained marine guides to assist, mineral water/tea/coffee and snacks on the dhow, a wonderful seafood lunch served with wine, beer, soft drinks.